Achieve a youthful complexion with the Cane and Austin Miracle Plus Pads; a maximum strength facial treatment that tackles the visible signs of ageing. 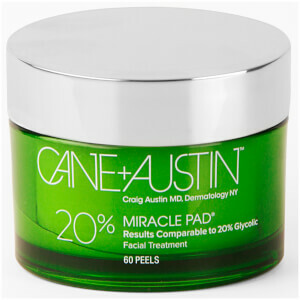 The Miracle Plus Pads are the most intensive version of Cane and Austin’s peel and is able to deliver comparable results to a 30% Glycolic Acid medical grade clinical treatment. With one simple swipe, the convenient pad reveals a luminous complexion that radiates vitality. Ideal for all skin types including sensitive skin, the anti-ageing pads work to visibly even skin tone and promote collagen production in skin. Collagen helps to encourage a youthful visage by visibly plumping skin, which reduces the appearance of fine lines and wrinkles. Use the peeling pads twice a day to encourage younger looking skin that is radiant and uniform. Free from parabens and fragrance. Each morning and evening, swipe pad over clean face avoiding the eye area. For sensitive skin, use once daily for the first week, then increase to twice daily. A tingling sensation may occur and is normal. Caution: For external use only. Avoid eye area. If product gets into the eyes, flush with water. If irritation persists, contact your physician. Sun Alert: Prior to sun exposure, cover areas to which the product has been applied with sunscreen. Keep out of reach of children. Water, Glycolic Acid, Hamamelis Virginiana (Witch Hazel) Extract, Ammonium Hydroxide, Lactic Acid, Salix Alba (Willow Bark) Extract, Phytic Acid, Tartaric Acid, Salicylic Acid Phospholipids, Retinyl Palmitate, Ascorbyl Palmitate, Tocopheryl Acetate, Cucumis Sativus (Cucumber) Extract, Chamomilla Recutita (Matricaria) Flower Extract, Ubiquinone (Coenzyme Q10), Polysorbate-20, Menthol, Phenoxyethanol, Sodium Benzoate, Acetone, Disodium EDTA.